Maybe it’s because of the TDWI conference now going on in San Diego, but this morning’s webinar on “Making Data Beautiful for Business Users” seemed a bit of an afterthought. The presenters were Dave Stodder, TDWI Director of Research, and Allen Bonde, VP Product Marketing and Innovation, Actuate. There were a few interesting moments, but not a lot of even basic content. Dave Stodder began with a whole bunch of quotes from other people. I admit, it’s a quick way to put together a presentation, but then you should paraphrase and explain why the quotes matter rather than just reading them verbatim – we, the audience, are already doing that. To be honest, those are accurate but also valid for every other point in reporting throughout history. Businesses always want to enable decision makers to help make more accurate and timely decisions through better information. What followed was one of the keys to TDWI success: An interesting slide based on one of their surveys. Improved operational efficiency was a clear number one. The problem is that the data is most likely from IT respondents rather than from business users. I asked the question about that but it wasn’t answered. I predict that if you asked business users you’d find the second two items, faster response and identify new opportunities, would be at the top. One important point Dave Stodder made was about alert fatigue. It’s tempting to have visualizations and other tactics that alert anytime things change, but too many alerts mean people stop paying attention. It reminded me of my days as a sales engineer, back in the days of pagers. Another SE and I had to sit down one of the sales people and explain that if he appended 911 to every page then nothing was important. The only part purely focused on visualizations were two slides. One was just a collection of a few visualization types and the other was another TDWI survey about which visualization types are currently being implemented. There wasn’t a discussion of the appropriateness of the ones being used the most, any reason to better focus on some being ignored, or any discussion about how many are provided by packaged BI tools versus are home grown by the supposedly valuable data scientists. Allen Bonde then took over and didn’t focus on visualization. He gave a rather generic Actuate sales pitch, mentioning platforms built for scale, the importance of an open community and didn’t show any visuals on visualization. It wasn’t that the presentation was terrible, it’s only that it was far too generic. What was said about visualizations could be said about just about any reporting and there wasn’t really any direct focus on visualization. It’s one thing to quote Tufte, it’s another to have a discussion about current tools and what’s coming. That later was missed. Maybe after the conference we’ll see another webinar with clearer focus. 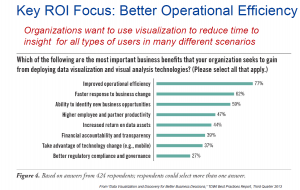 This entry was posted in Business Intelligence and tagged actuate, business intelligence, data visualization, tdwi, teich communications on September 23, 2014 by David Teich. The topic was “Accelerating your Analytics for Faster Insights.” That is a lot to cover in less than an hour, made more brief by a tag team of three people from different companies. I must say I was pleasantly surprised with how well they integrated their messages. Mark Theissen was up first. There were a lot of fancy names for what Cirro does, but think ETL as it’s much easier. Mark’s point is that no single repository can handle all enterprise data even if that made sense. Cirro’s goal is to provide on-demand distributed analytics, using federation to link multiple data sources in order to help businesses analyze more complete information. It’s a strong point people have forgotten in the last few years during the typical “the latest craze will solve everything” focus on Hadoop and minimizing the role of getting to multiple sources. Peter Hoopes then followed to talk about doing the analytics. One phrase he used should be discussed in more detail: “speed wins.” So many people are focused on the admittedly important area of immediate retail feedback on the web and with mobile devices. There, yes, speed can win. However, not always. Sometimes though helps too. That’s one reason why complex analysis for high level business strategy and planning is different that putting an ad on a phone as you walk by a store. There are clear reasons for speed, even in analytics, but it should not be the only focus in a BI decision. IBM’s Amit Patel then came on to discuss the meat of the matter: DB2 Blu. This is IBM’s foray into in-memory, columnar databases. It’s a critical ad to the product line. There are advantages to in-memory that have created a need for all major players to have an offering, and IBM does the “me too!” well; but how does IBM differentiate itself? As someone who understands the need for integration of transaction and analytic systems and agrees both need to co-exist, I was intrigued by what Amit had to say. Transactions going into normal DB2 environment while being shadowed into columnar BLU environment to speed analytics. Think about it: Transactions can still be managed with the row-oriented technologies best suited for them while the information is, in parallel, moved to the analytics database that happens to be in memory. It seems to be a good way to begin to blend the technologies and let each do what works best. For a slightly techhie comment, I did like what Mr. Patel was saying about IBM’s management of memory and CPU. After all, while IBM is one of the largest software vendors in the world, too many folks forget their hardware background. One quick mention in a sentence about “hardware vendors such as Intel and IBM…” was a great touch to add a message that can help IBM differentiate its knowledge of MPP from that of pure software companies. As a marketing guy, I smiled big time at the smooth way that was brought up. The three presenters did a good job in pointing out that the heterogeneous nature of enterprise data isn’t going away, rather it’s expanding. Each company, in its own way, put forward how it helps address that complexity. Still, it takes three companies. As the BI market continues to mature, the companies who manage to combine the enterprise information supply chain components most smoothly will succeed. Right now, there’s a message being presented by three players. Other competitors also partner for ETL, data storage and analytics. It sounds interesting, but the market’s still young. Look for more robust messages from single vendors to evolve. This entry was posted in big data, Business Intelligence, Cloud, Enterprise Software and tagged actuate, business intelligence, cirro, dbta, ibm, in-memory analytics, teich communications on September 18, 2014 by David Teich.